L' FAIR QUILTS: Scrap Control Update - Kitchen Sink #1! Scrap Control Update - Kitchen Sink #1! Kitchen Sink #1 (i.e. I used about everything but the kitchen sink from the 3 1/2" scrap bin) is ready for the long arm except for joining one seam down the middle. There is another quilt loaded on the long arm underneath, so it won't be long -- and I found the perfect striped binding. The blocks are 6" finished, 9 blocks across and 13 down, for a total of 117 blocks. If I don't add a little border, then it will finish at 54" X 78". I had a little of the light pink left, but can't put my hands on it (maybe that is a sign I'm done!). The blocks are also ready for "Kitchen Sink #2" to make a top. These blocks finish at 10"...I used strips of (2) 2 1/2" and (1) 1 1/2" -- more detail on the assembly of the blocks are here. Now is the time for me to start thinking about my September Scrap Control Project --- I have a choice of two. 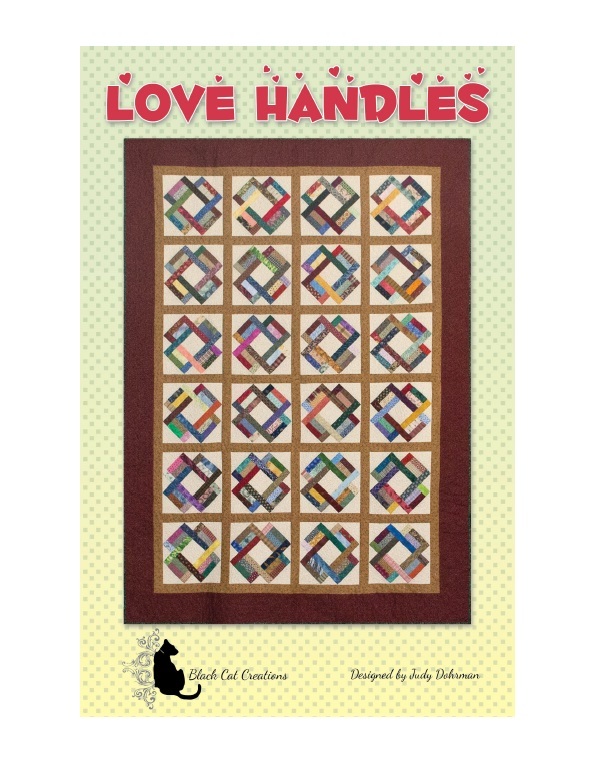 The first is Love Handles, a pattern designed by Judy Dohrman, published by Black Cat Creations. I purchased this pattern thinking it would kick start another attack on the scrap bin. The other pattern is my Summer Wedding Pattern, which may be perfect to reduce a large Oriental Stash. I follow along with Sarah at Confessions of a Fabric Addict, who helps us stay accountable to the growing scrap bins. It is a never ending task .... one that I hope never ends!!! I absolutely LOVE your Kitchen Sink quilts!! That striped binding fabric will be perfect for KS1. Happy finishing! This is so cool. I went back through your links to see how you made the blocks. I do have several rulers to make the triangles, so I'm going to put this on my list (which is woefully long). Thanks for sharing and for the details on pressing which are very helpful. Hello, my sister from another mother! It seems we are thinking on the same wavelength this week! Love your Kitchen Sink quilts - hope mine turns out just as pretty!